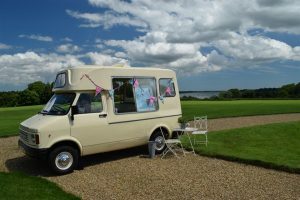 Rhubarb is a classic Bedford CF ice cream van from the 80’s, lovingly restored to her former glory, offering great ice creams, some handmade especially for you! We do love a good wedding! Rhubarb can arrive outside your church, wedding venue or reception and serve you and your guests some delicious ice cream treats. Fabulous for photo opportunities galore and sure to put a smile on everyone’s face too! Rhubarb arrives with all her bunting, table and chairs with vintage music playing in the background if you wish or even the original van tune ‘Bells of St Mary’s’.